Grey looming clouds hung heavy in the Creek County air last Saturday as I drove into Sapulpa to visit family. To the unknowing, the dark sky would have signaled a welcoming rain in this never ending drought, but to Oklahoma residents, it was a symbol of fear and heartbreak as wildfires ripped across their hometowns. As I sat in my Aunt and Uncle’s living room, watching scenes from the fires glaring at me from the evening news, and evacuation notices scrolling across the bottom of the TV screen I couldn’t shake the helpless feeling that was beginning to overwhelm me. I should be there, I should be helping! 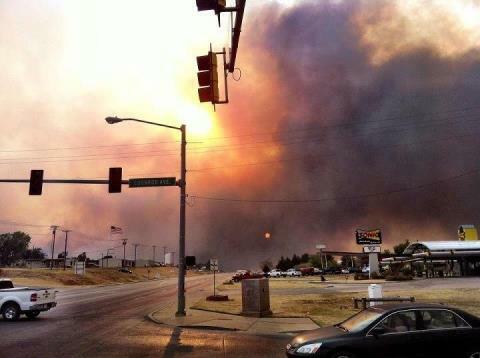 Over and over those thoughts rolled through my head, picking up urgency as more Creek Co. towns were forced to evacuate. Up until very recently I was a Wildland Firefighter. Most little girls want to grow up to be teachers, nurses, movie stars, and while later in my childhood I explored all those options, 5-year-old me informed my mother I was going to be a firefighter when I grew up. And I did, just that, however juggling college and firefighting is not the easiest task, and I was forced to give it up this past year in order to focus on school and graduation. For me I always loved the adrenaline rush and excitement that walks hand in hand with fighting fire, but Saturday as I sat helplessly on the couch a different feeling began set in. Instead of feeling disgruntled that I was missing out on the action, I could feel my heart breaking. So Saturday as I sat there watching wildfires tear across one of the places I call home, knowing I had the training and experience to help, but couldn’t, left me with knots in my stomach and a heaviness in my heart I couldn’t shake. 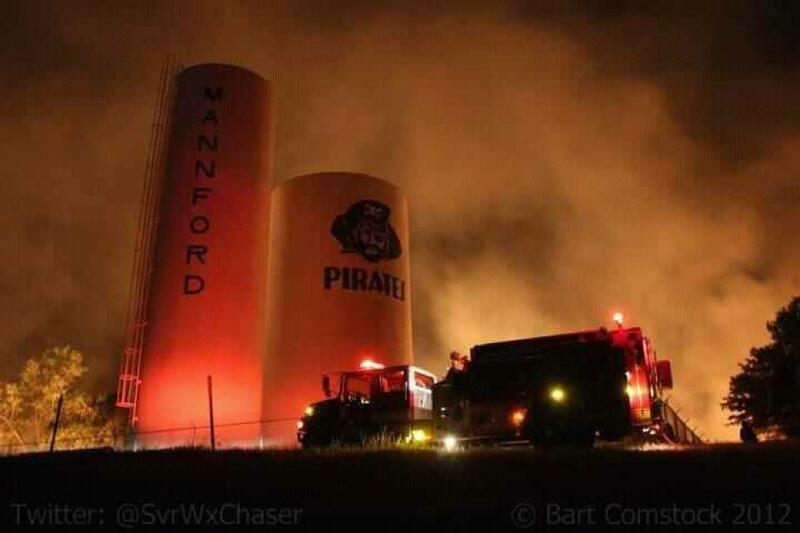 My parents must have been watching the news as well and sensing how torn I was feeling, because during my drive back to Fairland later that evening I received a phone call with them ensuring I was on my way home and not trying to find someway to get into Mannford. I downloaded this picture from a friend’s Facebook page. There was nothing I could do though… or so I thought. Last night I was contacted by an acquaintance from Mannford via Facebook asking if there was anyway I could help get the word out through my blog. She went on to tell me how many area producers are left without hay and feed for their livestock, and how 60+ families have been left homeless. I know right now everyone’s wallets are a little empty, but if anyone has extra items laying around the house, or has a church family that would like to get involved, I will be listing all the donation information and where it needs to be sent below. If anything, I ask that you please keep all the families of Creek Co., as well as others effected by the Oklahoma wildfires in your thoughts and prayers during this time of restoring and healing. Any other questions or thoughts about how you can help feel free to contact me. I’m so glad to hear that. I’ve been thinking about both of y’all a lot, and was getting ready to contact you if I didn’t hear soon how the house fared. Exactly! With as dry as it is, the ground is a matchbox just waiting to be struck. People need to be exceptionally careful right now. Love you too! This is a post by a good friend & fellow Cowboy, Danielle Beard. She’s pretty amazing. Enjoy.